(Editor’s note: Starting this year, the authors present a map of the night skies for 10 p.m., accompanied by an in-depth article covering a celestial feature for each month, followed by a general scientific interest article). The Orion constellation -- its general orientation: One of the more prominent winter constellations is Orion the Hunter, usually seen at this time of the year over the southern horizon around 10 p.m. Its unique shape is outlined by the four bright stars Betelgeuse, Bellatrix, Rigel and Saiph, with a prominent three-star belt in the center and an imaginary sword pointing southward that features a grand nebular birthplace of stars, Messier 42. Orion is truly a masterpiece in the sky. The mythical “hunter” is accompanied by his two dogs, Canis Major and Canis Minor, to the east. Two of the 10 brightest stars in the skies are located in Orion, Rigel (sixth brightest) and Betelgeuse (eighth). Nearby, to the southeast in Canis Major, is the “dog star,” Sirius, the brightest star in the sky after the sun. To the east is Procyon (seventh brightest) in Canis Minor. Finally, to the west, is Aldebaran (13th) in Taurus and, to the north, Capella (11th) in Auriga. Read more about Orion at http://www.constellation-guide.com/constellation-list/orion-constellation/. Planet alert: Jupiter can be seen during most of the early evening in Taurus near Aldebaran. Saturn rises in the east around 3 a.m. and Venus rises right before the sun as the morning star. Shortly after sunset, Mars fades fast into the western horizon. Last month, we discussed the 1900-1901 discovery and dating of the Antikythera Mechanism, found in an ancient shipwreck (circa 85 B.C. ), in 82 fragments reconstructed as 30 gears. The mechanism is regarded as the first analog computer, possibly built by Archimedes, according to the lunar theory of Hipparchus. It was, at least, a solar-lunar clock, constructed to calculate the positions of the sun and moon, as well as times of eclipses. The gearing and operation demonstrate detailed Greek knowledge of celestial motions from the 300-100 B.C. era. Based on a geocentric model of solar system, some of the required gearing reflected the intricate theory of epicycles, required to make accurate predictions. The main, largest gear was about 55 inches in diameter, and was operated by crank to set the date and to control the rest of the gear train. The front face of the mechanism had two confirmed pointers. Given the available real estate, possibly up to eight pointers could have been accommodated: one for day of the year, and seven for "planetary" positions -- the sun and moon, and the five known planets of the time. The latest developments from the Antikythera Mechanism Research Project and affiliated scientists propose a total of 37 or more gears in the complete design, sufficient to calculate at least crude positions for the planets. Various proposals for arrangement of missing planetary gears have been put forward. The year was demarcated into 365 days with compensation for an extra day every four years. Inscriptions indicated 13 Egyptian months, 12 zodiacal constellations, significant star clusters. including the Hyades and Pleiades; and the very brightest stars. The rear face contained additional inscriptions for months used in other Greek regions, and dials associated with eclipse calculations within the Saros, Metonic, Callippic and Exeligmos calendric systems. The well-known 18-year Saros eclipse cycle is improved upon by the other systems which are longer, the longest being the 76-year Callippic cycle. Thus, to achieve good design accuracy, data from several Callippic cycles must have required astronomical observations from several prior centuries. Further inscriptions on the device include a compact "instruction manual," suggesting that its use was intended by non-experts. 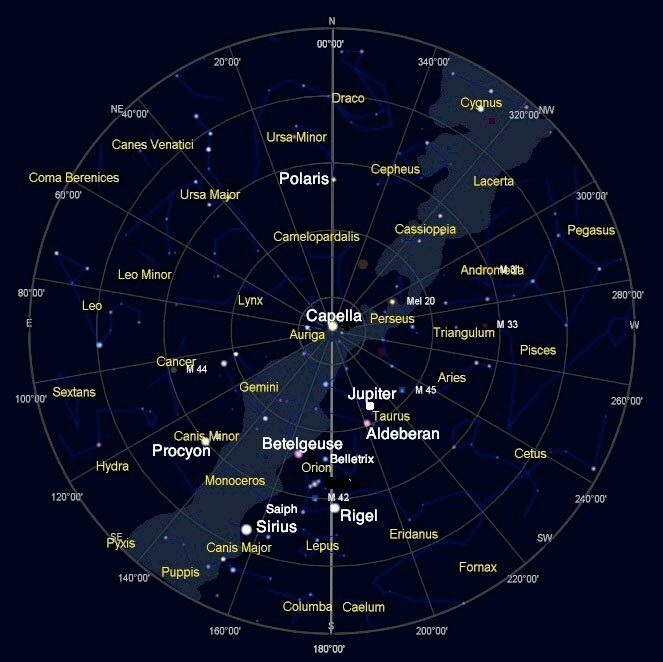 To view this month's sky chart, click here.